Please note that peeling the carrot and sweet potato is optional. Just be sure they are initially chopped small so that everything can be easily consumed for little ones without teeth. Here’s a quick recipe for a fun little indoor frozen treat. I made it initially with just bananas, but it was such a hit with out middle child, that I added blueberries and changed the name from “banana treat” to “buttons”. We’re having a blast making these with different ingredients, and it’s a fun change from traditional smoothies in a cup. 6.Once frozen, simply pop out and serve! 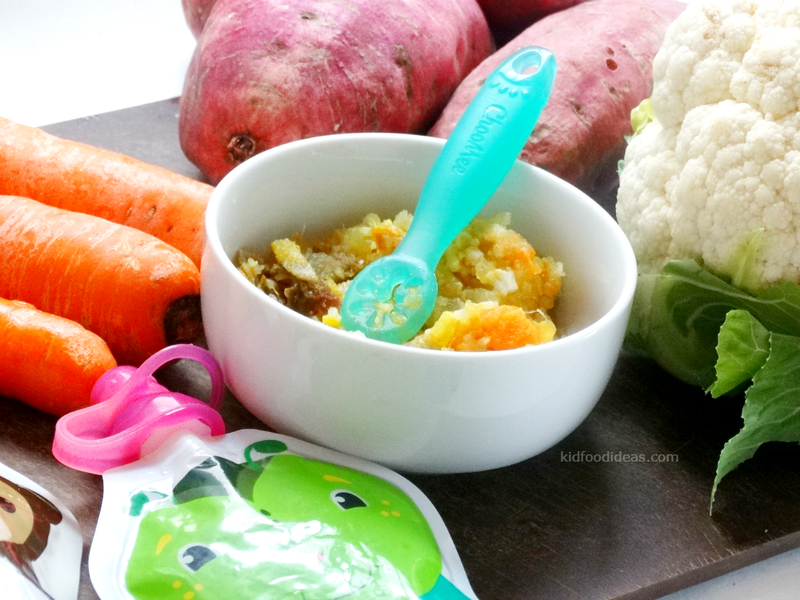 As a mom of three, I have to say that weaning is definitely one of my favourite stages of our childrens’ lives so far. It’s a time to taste new flavours, see new colours and feel new textures. It’s just a beautiful time of exploration for the little ones, and I am honoured to be able to see it happen first hand. Of course during this stage, our children are perfecting their motor skills, and slowly figuring out exactly what eating entails, so messes and spills are expected. With that said, every so often, there comes a time where a product comes out on the market that helps make our lives as parents just a little bit easier. This is where this new plate by Nuby comes in. The plate I am referring to is the Nuby Sure Grip Miracle Mat Section Plate. It’s made of 100% silicone, and suctions to most flat surfaces, making it harder for children to pick up the plate or tip it over. We have an adorable and energetic little girl who uses the “pick it up and chuck it” technique to let us know she has completed a meal. Our middle child used to do the same thing, and while it can be cute to see the look of satisfaction on their faces, cleaning up the mess is not always as amusing. These suction plates make it a little harder for children to pick up, which means I have the pleasure of being able to blink without fear of her making a swift move and making a huge mess. •They are made from 100% silicone, which is BPA free, and a lot safer for our children than plastic plates. Many parents are shying away from plastic tableware because toxic chemicals can leach into the food. That is a scary thought. •The material is also microwave and dishwasher safe. So you’re free to reheat your child’s food without worry. •They stick to the table and high chair! If you pick it up from a corner, it comes right up. Our baby girl is a year old, tugs at the sections of the plate, and has no success in flipping it over. I can’t count how many possible messes I have avoided cleaning. •Separate compartments on one plate allow you to serve multiple items without them touching. The plate does not fit the tray for baby’s high chair. I would love to see a slightly smaller model of plates. In the meantime, if you have the same issue, you can strap baby in the high chair, and push the chair to the table to eat with the adults. You can see from the images above that she’s still slightly short for the table, but she reaches her food fine and enjoys eating at the table with her older siblings. Another thing I noticed is that if the flat surface of the plate is the slightest bit oily, it will not stick half as well. Be sure to wash it well, be it through the dishwasher or by hand. Also take note that it fits MOST surfaces, and I say that because I have seen one or two reviews stating that it didn’t actually stick to someone’s table. We have a wooden table, and a glass table, and our plate sticks firmly to both with no problems at all. 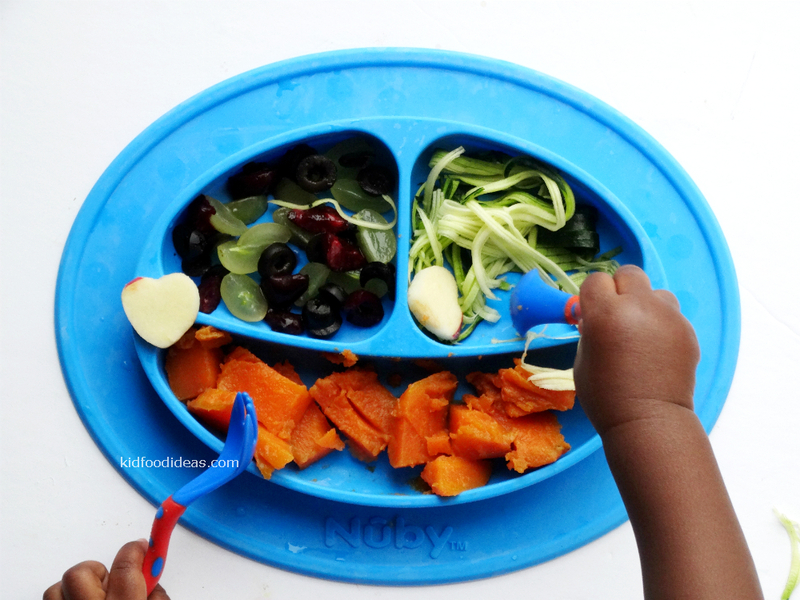 Overall I am happy with our suction plate by Nuby, and our children approve of it as well! *****I have received a sample for review purposes. I have not been financially compensated for writing this review. All opinions are my own.